Great Britain have been crowned men's team pursuit champions in the UCI Track World Cup series after taking bronze in the final round in Cali, Colombia. Germain Burton, Matt Gibson, Chris Latham and Mark Stewart beat Denmark in the race for thir place by just under half a second. 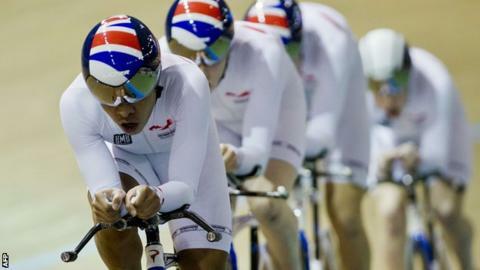 GB won in the London round in December and finished with 810 points, ahead of Australia with 780 and Denmark on 662. It is their fourth World Cup trophy, following wins in 2005, 2008 and 2010. The 16-person squad for the Colombian round includes several Olympic academy programme riders to give them top-flight international competition experience.